• fauzybeey@osahon87 use your brain! 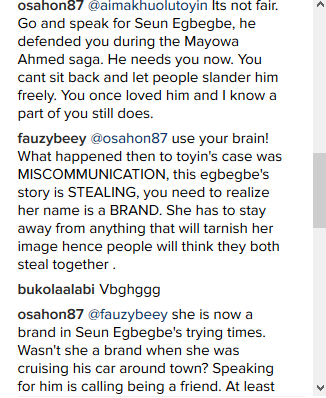 What happened then to toyin's case was MISCOMMUNICATION, this egbegbe's story is STEALING, you need to realize her name is a BRAND. 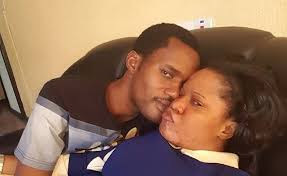 She has to stay away from anything that will tarnish her image hence people will think they both steal together. 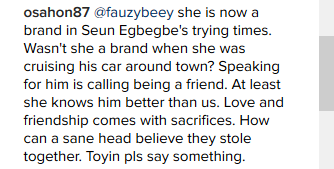 • osahon87@fauzybeey she is now a brand in Seun Egbegbe's trying times. Wasn't she a brand when she was cruising his car around town? Speaking for him is calling being a friend. At least she knows him better than us. Love and friendship comes with sacrifices. How can a sane head believe they stole together. Toyin pls say something.